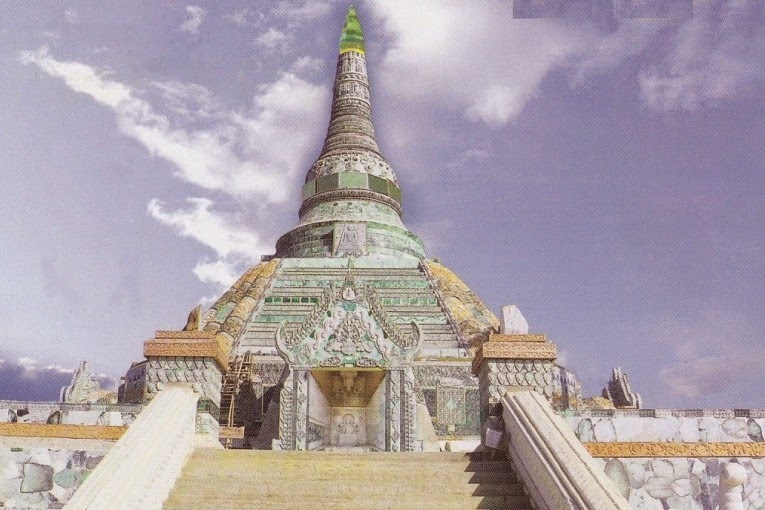 The above is the Jade Pagoda in Mandalay. The builder collected jade for 25 years for this temple. There is 10,000 tons of jade, no bricks, and the cost is $400,000,000 plus $15,000,000 worth of jade. The grand opening is on 1 June, 2015. It is only one of it's kind in the world. Now that would build lots of orphanages and schools. We went to a Chinese restaurant for lunch and photographed some poor things that were waiting to be on the menu. A bit hard to see through the glass, but one lot looked like giant yabbies, and another black and white striped lobsters. They also had rather large turtles. So on the menu was tripe (if you are our age you will know what that is. I cooked it for my kids once, and they still have never forgiven me) , goose livers, turtle, rabbit, pigs trotters, and the most fascinating of them all, "jellyfish head salad". Below is a duck dish, heads and all. Apparently the brain is very nice. Enough of the culinary joys of Myanmar. Tomorrow, we head for Kathmandu. A full days travel, as we go through K.L. and then on to Nepal. We are hoping the weather is kinder to us there. It has been a very full two weeks, and it has been amazing to see the hand of God is many unexpected ways. There will be some interesting days ahead.